What makes Neustaedter’s Fine Jewelers special in the industry? 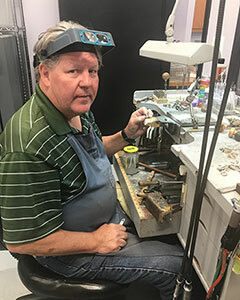 We do all of our own work on site, and our jeweler is a Master Jeweler. That means your precious family treasures are never ” shipped” to another location, who knows where. We focus on one piece at a time, giving each job the focus and time it deserves. It never leaves our St. Louis store. At Neustaedter’s there is no production line environment, where things can get misplaced. It also means the person working on your piece has decades of bench experience, no apprentice or trainee working on your jewelry. We have the most state-of-the-art, current technology on the premises giving us the ability to offer services that the chain stores just can’t. The staff at Neustaedter’s are all professionals and can answer your questions while you are in the store. Have you ever been frustrated by an experience like the following: “We will have to ship your job to our shop to get an estimate, it will take a week or two”. Then when you get an estimate, if you have a question, they have to contact whoever did the estimate and then get back to you, another week or two later. At Neustaedter’s, If your specific job is complicated, and we need to research replacement gems, you will still have an answer in a couple of days, maximum. We are a family-owned store, where everyone on the staff is a professional with over 20 years of experience. This gives you a huge benefit in that all of that real world experience is right at your fingertips. Have you ever seen your diamond under a Gemscope? We have the best microscopes on site. We enjoy sharing the details on your piece with you, so you can see exactly what we are describing. You get to see your diamond at the time of drop off and pick up. Our shop has all of the state-of-the-art cleaning equipment, so we can get it in good enough shape so you can see all of the details. Of course it will be cleaner after pick up, but you will know this diamond, sapphire, ruby is Your piece. We are more than happy to look at the family heirlooms to let you know what is ” real ” and costume. Even if your piece was not purchased here, our professional staff will be happy to thoroughly clean and check it for you while you wait. If the item needs work, we can almost always give you an accurate estimate while you are in the store. There is never any pressure, just a sincere desire to help you with that special piece. We also have the ability to do professional appraisals on site. Again, we give you all of the details you need to guarantee your treasure is adequately covered by your insurance company. And if they need more information, we are available to answer their questions. Let us show you the difference! So, we will see you soon! Happy Monogram Monday! Here’s a look at what goes into the rare art of MASTER HAND ENGRAVING from beginning to finish with our very own Richard Neustaedter. There are some things a machine just can’t replace— and that’s the quality that comes from hand-crafted jewelry that will stand the test of time.